The Language of Solitude does not start well. Protagonist Paul Leibovitz yearns for his partner, Christine Wu (both return­ing from Sendker’s previous novel, 2015’s Whispering Shadows). He is financially independent, she the manager of a minor travel agency – both live in Hong Kong. In or close to middle age, both enjoy nice things. He aches for her phone calls but hesitates to send text messages, lest he seem needy. Their initial conversations are near comically anxious. Paul is concern that Christine is less enamoured, less immediately comprehending of his needs and emotions than she once was. So far, so inconsequential. Then things begin to click. The dis­connect between Paul and Christine comes to seem less an entrance to a romcom, where all the narrative intri­cacies could be solved if only the characters would speak to one another, and more a metaphor for how people, and societies, are silenced. This silencing resonates throughout the novel, especially when the action moves to mainland China. Paul searches for information on the internet, for instance, but the websites he finds are censored. Sendker though doesn’t bludgeon the reader with the symbolism and so the narrative feels natural, not forced. Christine has been summoned to China by long-lost brother, Da Long, who was separated from the family during the Cultural Revolution, when she and her mother escaped to Hong Kong. (Absence, silence and unexorcised pain are all motifs.) Da Long’s wife, Min Fang, is suffering from a mysterious illness. The local doctors can find no cure and have effectively given up on her, and Da Long doesn’t have the money to take her to Shanghai for treatment. Paul suspects he knows the cause of her illness and takes it upon himself to investigate. In doing so he comes into conflict with both local authorities and Da Long’s children, including his son, Xiao Hu, an ambitious Communist Party member. There is much here to enjoy. Sendker knows Hong Kong and the mainland, and in early chapters conjures the outdoor food stalls in Stanley Street, the World Peace Cafe, in Tai Wong Street East, Wong Tai Sin Temple and Queen’s Road Central (“one of the most expensive addresses in Hong Kong,” he somewhat gauchely notes). Likewise, the dust, barking dogs, blazing heat and expressionless old men intermin­ably sitting outdoors on wooden stools in Da Long’s village will be familiar to anyone who has visited these areas. Sendker also understands Chinese politics, with its zeal for face, its elisions, refusals and brutality. The doctor who examines Min Fang does so at the request of Xiao Hu, and the brusqueness of his manner, and the sense of it being a favour requiring repayment, suggests much about those in positions of authority. Xiao Hu has little concern for the cause of his mother’s illness; when Paul suggests it might have been man-made, he displays an egregious but comprehensible pragmatism – essentially arguing that you can’t buck the system. When we see what happens to those who try, this comes as little surprise. 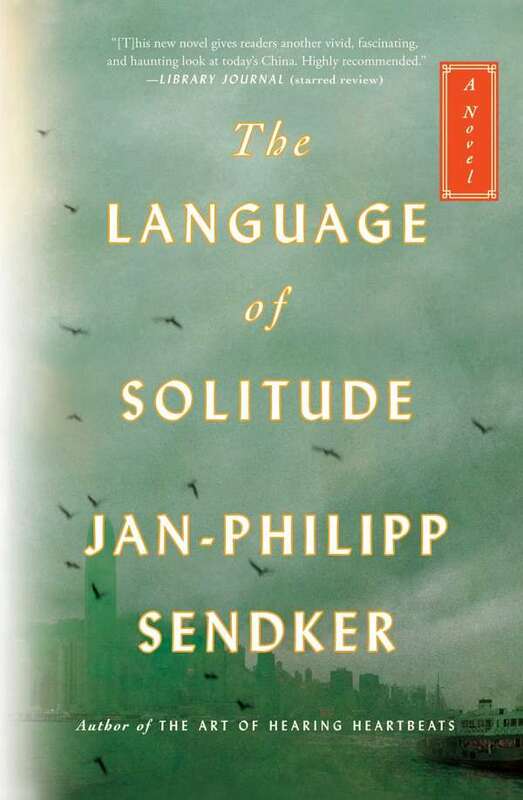 Though The Language of Solitude becomes enjoyably readable, it does have weak­nesses. Translated with clarity from Sendker’s German, the prose can sometimes grate. Sendker likes staccato phrases and verbless fragments and while these, in moderation, have their place, overuse can interrupt the flow of prose. A little elegance goes a long way. Despite this, The Language of Solitude largely succeeds. While not in the same class as James Clavell’s novels about Anglo-Saxons discovering Asia, it is undoubtedly of that school. The action might in places be clichéd and the storyline occasionally veers towards the melodramatic – and the first 10 pages are more to be endured than enjoyed – but in the end this is a fast-paced, entertaining read that has something worthwhile to say about modern China.